Is Seadrill LTD a Buy? Seadrill stock might look cheap today, but there's one simple reason why investors should hold off for now. Seadrill LTD (NYSE:SDRL) announced recently that it has begun a "comprehensive restructuring," including pre-arranged Chapter 11 bankruptcy filings that will allow the company to substantially reduce its debt load and emerge a stronger, better company. Furthermore, the announcement also disclosed that existing shareholders should retain part of the company when it recapitalizes in the near future. While the bad news for existing shareholders is that much of their interest in Seadrill will be diluted when the majority of the company's equity is exchanged to bondholders and lenders as part of its pre-negotiated restructuring, it's clear that some investors think this is an opportunity to get in on the company before it comes out of Chapter 11. I think that's a bad idea, and there's far more downside for investors who buy Seadrill shares at current levels. Instead, they could wait for the bankruptcy process to work its course, and then evaluate the company and its stock on the other side. Keep reading to learn why that's the case. Seadrill has one of the newest, most-capable vessel fleets in operation, which will play in its favor as the global fleet continues to shrink due to the scrapping of older vessels as they come off contract. Over the past decade, Seadrill has aggressively expanded its fleet of latest-generation floating and semi-submersible drillships, which are capable of operating in the deepest water and harsh conditions where much of the world's offshore oil is located. This contrasts with many of its competitors, which have been forced to scrap significant numbers of older vessels. Transocean (NYSE:RIG) recently announced it was scrapping six of its oldest drillships, taking a $1.4 billion non-cash asset writedown in the process. This is just the most recent move by Transocean, which has scrapped numerous other vessels over the past two years, and also sold off its entire jack-up vessel fleet for $1.35 billion this past spring as part of its focus on high-specification floating drillships. Diamond Offshore (NYSE:DO) also has scrapped plenty of vessels, including five just recently that were scrapped, in part, because they had been idle so long and it was cost-prohibitive to make them operationally competitive again. The problem is that Seadrill's newer, high-spec fleet was a product of the aggressive expansion funded by debt, which ultimately led to the company's bankruptcy. And while many of Seadrill's competitors are now scrapping vessels and taking a hit to their asset values, companies like Transocean, Diamond Offshore, and Noble Corporation (NYSE:NE) are also set to make it through the downturn without having to file bankruptcy to survive. When it comes to Seadrill's balance sheet, it should emerge from bankruptcy in solid shape. The company has more than $1 billion in cash on hand -- an amount that could increase as part of the reorganization -- and a significant portion of its debt will be converted to new shares. This will lower capital requirements in the future to pay down debt, but also interest expense. In short, it comes down to valuation. According to Seadrill's press release and SEC filing disclosing its bankruptcy plans, existing shareholders are expected to retain a 2% stake in the company when it reemerges from bankruptcy. But here's the catch: Seadrill would need to emerge from bankruptcy with a market capitalization of almost $9 billion for the current share price to translate to a profit. And that seems very unlikely based on how the market is valuing most offshore drillers today. SDRL Market Cap data by YCharts. Seadrill's current shares will be worth roughly 2% of the company when it emerges from Chapter 11. If we multiply the current $176.6 million market cap by 50 -- what it would take for the current shares to retain the current value at 98% dilution -- we get $8.8 billion. No offshore driller has traded for that valuation since oil prices were above $100 per share and generating significant profits, and it's more than twice what any are currently valued at. Seadrill should emerge stronger and well-capitalized, and with maybe the best fleet on water. But I think it's a stretch to call it worth twice as much as Transocean or Diamond Offshore, or nine times more valuable than Noble Corp. That's why I recently sold the small stake I still held, and added to my Transocean and Noble Corp holdings in recent months. I'll continue to follow Seadrill closely and will consider buying shares at some point. 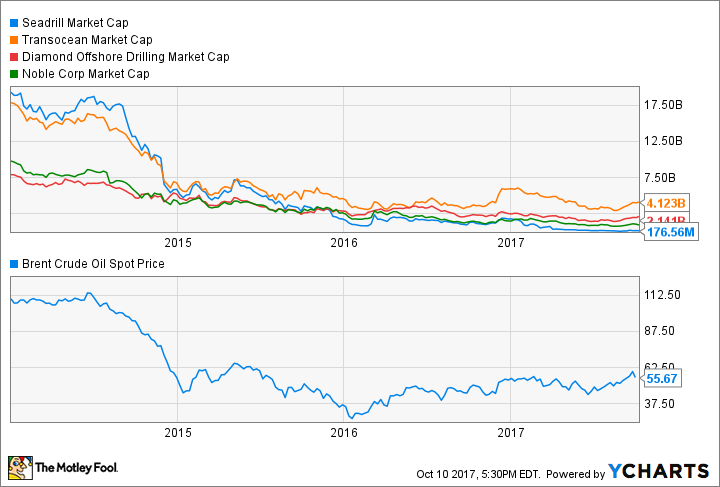 But until the market is more appropriately valuing the company -- which looks like it will have to wait until it emerges from bankruptcy -- investors should probably avoid Seadrill.